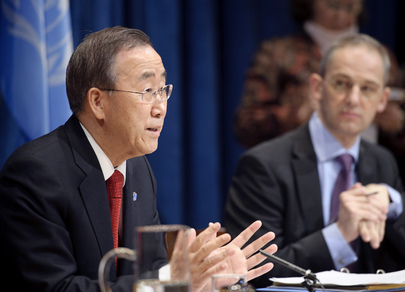 UNITED NATIONS, October 5 -- The day after a sharply divided Security Council failed to adopt a European drafted resolution on Syria, Inner City Press asked Secretary General Ban Ki-moon's spokesman Martin Nesirky what Ban thought of the result. Nesirky replied that Ban "regrets" it, and that Ban hopes the Council "will overcome divisions." Nesirky was immediately confronted with questions by other journalists, asking since Ban so often says "it's up to member states" -- as Nesirky would later recite in response to Inner City Press' request for Ban's view of Palestine's application to join UNESCO -- why Ban in this case regretted the votes of Russia, China, India, Brazil, Lebanon and South Africa. Nesirky's answers did not go beyond the prepared statement with which he responded to Inner City Press' question about the Syria vote. As Nesirky told one journalist to "refer" to a statement issued Friday about Bahrain, another left the briefing room, seeming to write up Ban's response to the Syria question. To some, Ban's comments may seem like leadership. To others it will seem like Ban trying to please or placate those perceived to have the most power, not unlike Ban's fast apology to Turkey's prime minister Erdogan after an incident that sent three UN Security staff, but no Turks, to the hospital. There are been further developments in that case, some of which Inner City Press also asked Nesirky about on Wednesday and which will be separately written up. Watch this site.